Sometimes you need a whisper, and other times a shout! When it takes loud surface disturbance and a big honking topwater to catch trophy bass, stripers, redfish and other tough gamefish, reach for a Cotton Cordell Pencil Popper. It walks-the-dog on top, but with its concave mouth, also catches and throws lots of water for tremendous surface disturbance. 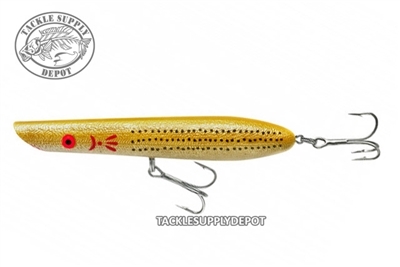 These big 6 and 7 inch lures are known for catching big fish, and the weighted tail aids in casting distance and accuracy, as well as adding more erratic action.